Correction or continuation? Bitcoin and its buddies are pausing from their earlier runs and might retreat to these nearby support levels. Bitcoin also busted through a long-term descending trend line after its earlier triangle breakout, adding confirmation that buyers have the upper hand. Price is consolidating inside a small triangle that appears as a bullish flag on the daily time frame. A break past the highs around the $5,300 level could mean that another leg higher might follow, possibly lasting by the same height as the flag’s mast. However, stochastic is already indicating overbought conditions or exhaustion among buyers and turning lower could signal that a pullback might take place instead. The 100 SMA is below the 200 SMA also, suggesting that there is some bearish pressure left. 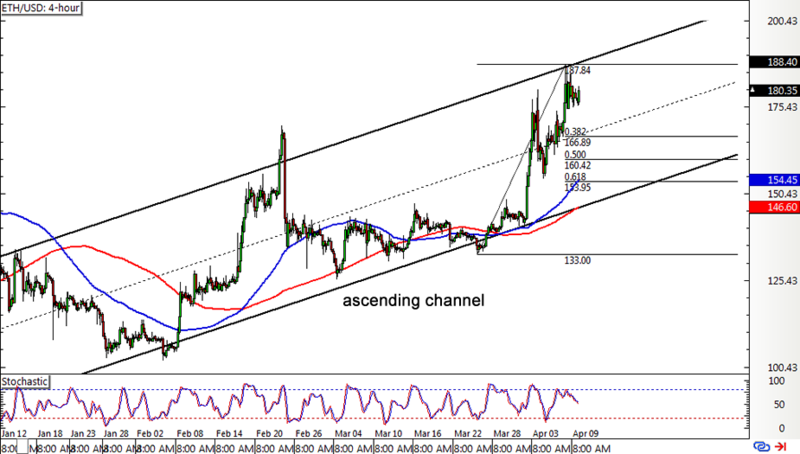 Ethereum is gradually climbing higher, creating higher lows and higher highs inside a rising channel on its 4-hour chart. Price has reached the top and might be due for a pullback from this resistance, especially since stochastic is starting to head south. Applying the handy-dandy Fib tool on the latest swing low and high shows that the 61.8% level lines up with the channel support around $154 and the 100 SMA dynamic support. This faster moving average is above the longer-term 200 SMA to confirm that the uptrend is more likely to gain traction than to reverse. Litecoin seems prime for a pullback as well, with technical indicators hinting that bulls are just waiting at nearby support zones. The Fib tool shows that price has corrected to the 38.2% level, which might be enough to keep losses in check. Price has formed higher lows while stochastic indicated lower lows, reflecting a bullish divergence that supports the odds of another rally. 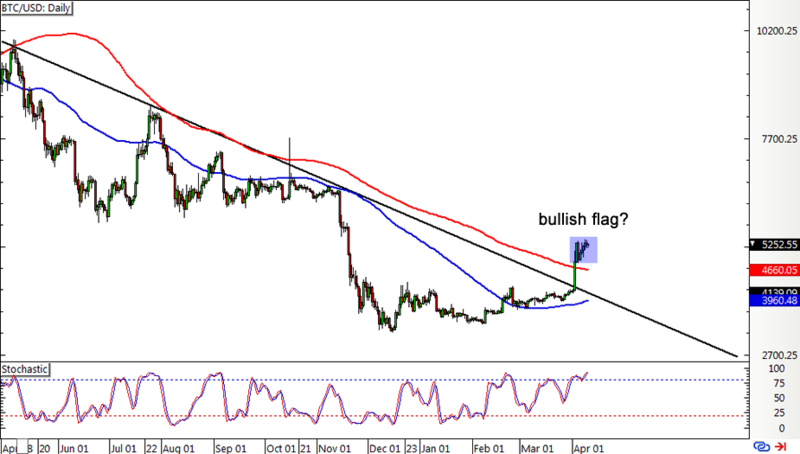 At the same time, the 100 SMA is above the longer-term 200 SMA to show the presence of bullish momentum. 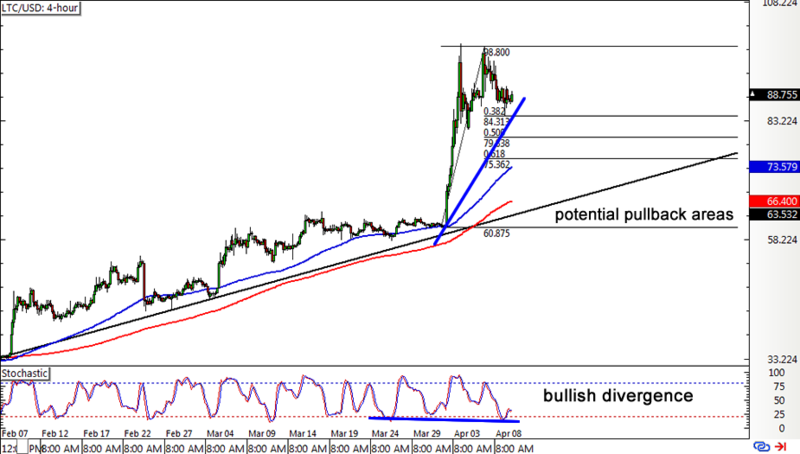 A larger correction might still be in the works, though, and litecoin might bounce off any of the Fibs or the rising trend line connecting the latest lows. 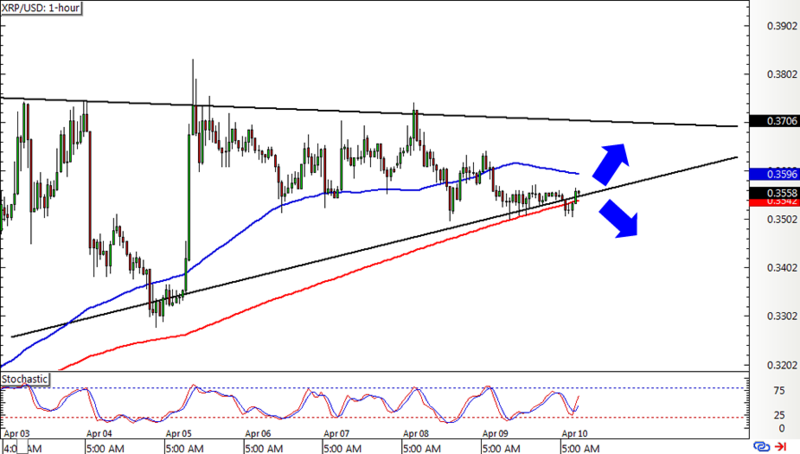 XRP is in yet another triangle pattern, forming higher lows and slightly lower highs. Price is currently testing the very bottom of this formation, still deciding whether to make a bounce or a break. The 100 SMA is above the longer-term 200 SMA, and the latter is holding as dynamic support so far. A break below this area, however, could mean that a selloff of the same height as the triangle might follow. Stochastic is pointing up to reflect a bit of bullish pressure that could be enough to take XRP back to the triangle top. Just be warned, there is a considerable amount of risk in trading cryptocurrencies due to their inherent volatility and sensitivity to headlines. Be careful out there!